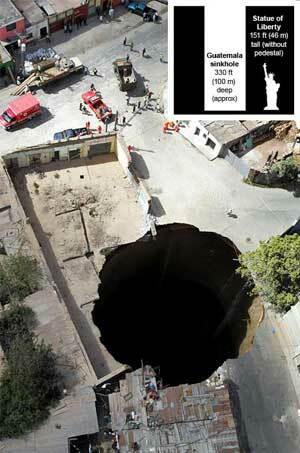 After rumbling for weeks, part of a poor Guatemala City neighborhood plummeted some 30 stories into the Earth on Friday. The reportedly 330-foot-deep (100-meter-deep) sinkhole swallowed about a dozen homes and is so far blamed in the deaths of three people�two teenagers, found floating in torrent of sewage, and their father, who was pulled from the chasm. Rainstorms and a ruptured sewer main may have caused the sinkhole, officials in Guatemala told the Associated Press. After the collapse, the seemingly bottomless depths gave off tremors, sounds of flowing water, and the scent of sewage. Just Damn! To think that it could happen that quickly. This page contains a single entry by DaveH published on August 27, 2008 9:23 PM. An interesting look at the history of today's Democratic Party was the previous entry in this blog. Another use for Marijuana is the next entry in this blog.